Thank you very much to Lovely Buns for nominating me for a Family of Bloggers Award! Candy has a really lovely blog full of great ideas and recipes, and so do the other blogs she has nominated, so check it out! Pay credit to the one who nominated you. Place a link to the one who nominated you on your award page. Nominate at least 4 other people to be in your family of bloggers and notify them of their nomination. Will Wander – musing and adventures at home and abroad. Fae’s Twist and Tango – Magazine of a Storyteller…articles about travel, food and recipes, with a twist and tango! I hope you manage to visit them if you don’t already know them! 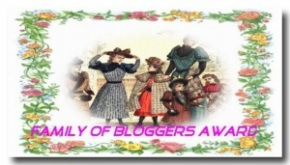 I passed Family of Bloggers Award to 6 bloggers, thanks to you! Congratulations! Very well deserved! And thank you so much for nominating will wander! It meant so much to me! Happy blogging!